How extraordinary! these creatures are wonderfully optimized for intelligence. They are not physically optimized to easily extend that intelligence, but we have that covered. Intelligence still needs input, so these creature observe a homogeneous three dimensional world and make the most of that. We seriously need to learn how to mind share. By this i do mean something much more that sharing images and communicating with images alone. We need to share the power of mathematics and need to allow document reading. So far we have been terribly clumsy. The great news is that they are willing. We must join with them to properly manage our oceans. That will ultimately employ billions of us. Licino, Aldo. “Just Animals? Mammalian Studies Point to an Anatomical Basis to Intelligence.” Mensa Berichten: Mensa International Journal Extra. June 1996. Pilleri, G. Behaviour Patterns of Some Delphinidae Observed in the Western Mediterranean. 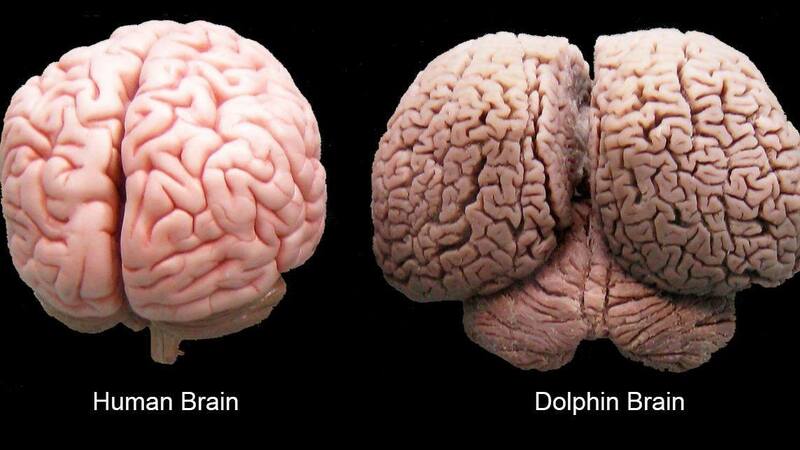 Illustration: Comparison of a human and dolphin brain showing the 4th lobe and more complex convulsions upon the neo-cortex of the dolphin as opposed to the human brain.